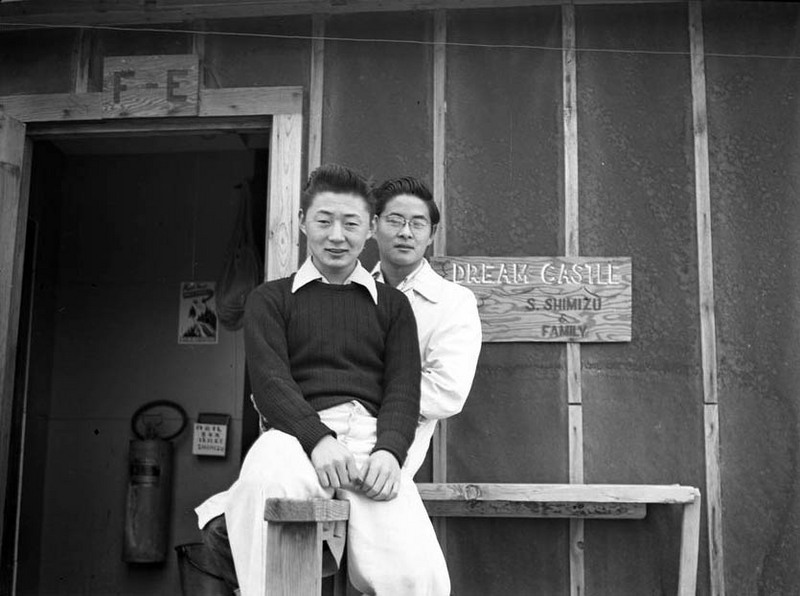 The sign in the background reading "Dream Castle" provides a tongue-in-cheek commentary on the accommodations available in the detention camps. During World War II, nearly 120,000 Americans of Japanese descent were removed from communities along the West Coast and in southern Arizona. They were ultimately confined to “Relocation Centers” built in harsh and isolated environments within the nation’s interior. This mass incarceration required the construction of ten large facilities and the formation of a new agency, the War Relocation Authority, which oversaw the dispersal and imprisonment of internees. Living in unfamiliar surroundings with new restrictions, but with no clear reasons for their imprisonment, the newly incarcerated Japanese Americans had to adapt as a community to their confusing situation. This exhibit explores this history through materials created and used by those who lived in the Relocation Centers. The pieces in this exhibit highlight the challenges and contradictions faced by those confined within the detention camps. For a more infromation see the added resources section of this exhibit.